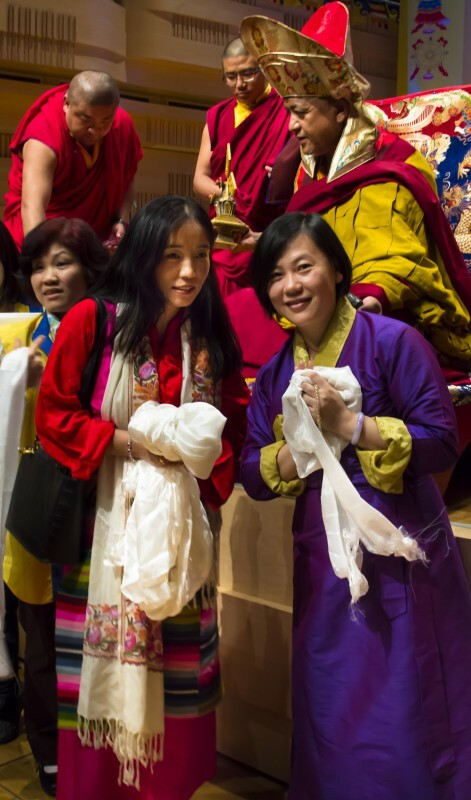 Over 600 people arrived on Sunday for the Thousand Arm Chenrezig Empowerment and Buddha Relics Blessing. The Committee members of Karma Samten Choeling make a mandala offering to Rinpoche. Committee members are: Albert Loo, Sin-tae Wong, Siew Keng Tong, Willow Mackay, Leslie Chan, Jane Yao. The Sangha and public waving their Kata’s during the Auspiciousness Of The Great Encampment ceremony. Sangha from Wat​ Phrayortkeo ​Dhammayanaram and members of the Lao community chanting prayers. As Rinpoche said in his conclusion speech “I am just a simple monk, I can not afford to pay for Monlam”. Without the donations of the Sponsors and other benefactors, the Kagyu Monlam would not be able to run in such a wonderful venue. The committee of Karma Samten Choeling and younger students reciting the Long Life Prayer for Rinpoche. Rinpoche ended the 2013 Australian Kagyu Monlam with his Conclusion Speech and Sangha Blessings.